The most important macro-economic news of this Friday is preliminary data on GDP in Eurozone for Q4 and volume of the US industrial output for January. As we know, gross domestic product is one of the main indicators reflecting the state of national economy, which also incorporates domestic consumption and public expenses, investments, imports and exports. According to prediction, preliminary GDP in Q4 will grow up to 0.2% and 0.4% on quarterly and annual basis respectively. Annual rate corresponds to the level in 2012. Germany and France continue to have in tow the whole Europe. However it should be noted that economic systems of the troubled Southern countries such as Italy and Spain started to recover in the last 6 month of last year. The data on the volume of the US industrial output for January, which will be released today, will demonstrate dynamics of production in mining and manufacturing industries as well as in public services. It is assumed that the index will remain at the previous level of 0.3%, failing to provide significant support to the American currency. Based on all fundamental data it is expected that European currency will grow against main counterparts. 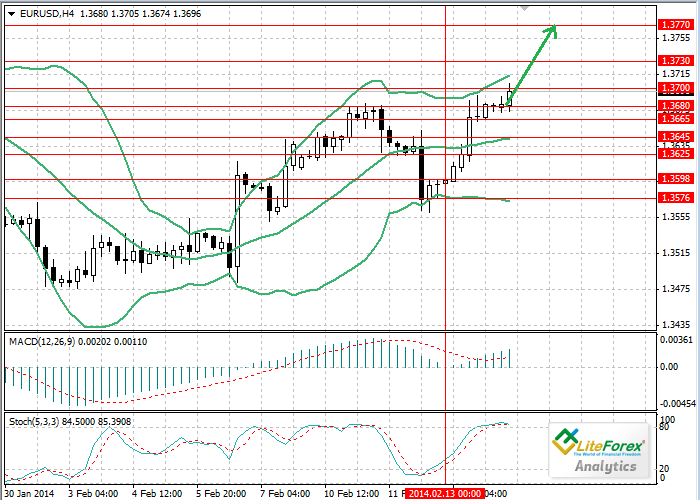 The price of the pair EUR/USD may continue to go up reaching the levels of 1.3710 and 1.3770.